So what is a Radical Doula anyway? Earlier today I looked over the language that had been on my Radical Doula??? page since 2009. I’m embarrassed that it took me so long to update it, but it was a good opportunity to revisit my definition of the term and how it’s changed over all these years blogging and working as a doula. One thing that is really important to me is that I do not own the term Radical Doula. I might rent the domain radicaldoula.com, but I by no means see myself as the arbiter of what a Radical Doula is. It’s a term that very much popped out of my mouth in a surprising way–really it was a way to describe the alienation I felt within the doula community. Over the years as I’ve continued theRadical Doula Profile Series (a way to relinquish ownership of the term and highlight anyone who identifies with it) I’ve noticed that for some doulas, simply being a doula, trying to change the culture of birth, in and of itself is a radical act. I understand that logic, but it is not what I meant when I started this blog. That does not make it wrong, it just makes it different than my original purpose. This page used to include a laundry list of the identities and politics I hold that made me feel alienated. It included things like being “pro-choice” or supporting the right to abortion, the fact that I’m Latin@, that my parents are immigrants from Cuba, that I identify as queer and genderqueer, that I approach doula work as activism. As the doula world has expanded, and as I’ve connected with more and more like-minded doulas through this blog, my definition of a radical doula has moved away from being centered on that laundry list of identities. Those still matter, don’t get me wrong, but I think what matters more is a political understanding of the role of the doula. 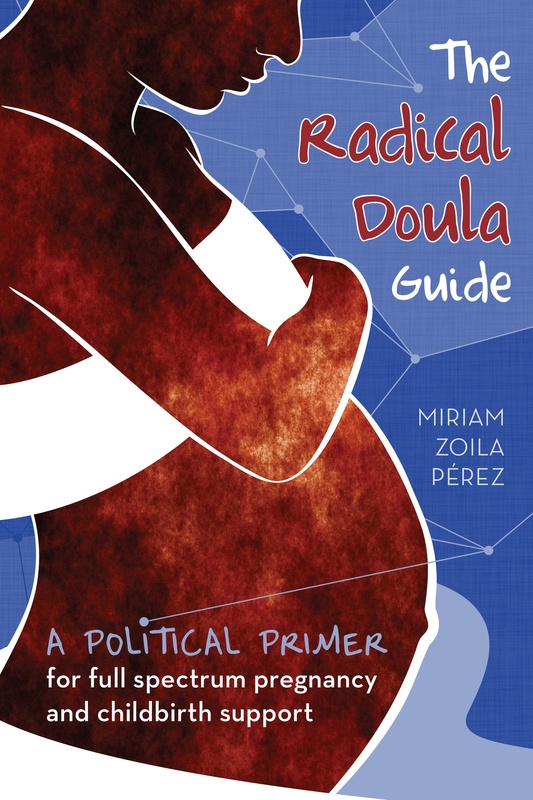 Being a Radical Doula, for me, is about understanding the politics of pregnancy and birth in the US, and working to use our role as doulas to interrupt this. I very much understand that our power to really change the balance of power is minuscule–but simply having a power analysis at all allows us to frame our work as doulas in a different way. This different way means working hard to make our services as doulas accessible to people who wouldn’t otherwise have doula support. The mechanics of this will look different for everyone, from volunteering with a program in a public hospital, to offering a sliding scale or barter system for your fees. It could be getting trained on how to support pregnant people with disabilities, or people who speak another language, or are queer or trans or gender non-conforming. The how will vary for all of us, but the bottom line is this: we care about working with marginalized communities, about providing doula support to those who would not otherwise have it. For me birth activism is about working to improve the pregnancy and birth experiences of those who are already suffering the most–not just improving the experiences of those who already have the best outcomes. It is not that those who already have the best outcomes (which, in most cases, could still be significantly improved) don’t deserve better–it’s that if we work to improve the experiences of the most marginalized, everyone’s experiences will improve. It doesn’t necessarily work the other way around. To me, being a Radical Doula is committing to the hard work of facing issues of racism, classism, ableism, homophobia, transphobia head-on in our work with pregnant and parenting people. It means understanding birth as just one instance in a wide spectrum of pregnancy-related experiences that include abortion, miscarriage and adoption, and understanding why doula support across that spectrum makes sense. It’s about providing non-judgmental and unconditional support to pregnant and parenting people, ultimately in service of social justice. As always, I invite you to explain why you identify as a Radical Doula by participating in the Radical Doula Profile series. Previous Article Can I be a doula if I’m physically disabled? Interesting to me that your ancestry contributes to your feeling “outside” of the doula community. My understanding is that the entire concept of the doula has its origins somewhere in central or south america… is that incorrect? My understanding is that formalized role of the doula, including that word, which actually comes from a greek word meaning woman helper or slave, is a role that originated in the US. The impact of a “doula” not really in the same way it is practiced now, but in having another woman in the room with a laboring mom, was studied by Klaus and Kennell with moms in a Guatemalan hospital–but as far as I understand, it was not a movement born out of Latin America. While the idea of providing support to people during pregnancy and childbirth is indeed very old and found around the world, the formal role of a “doula” as I understand it originated in the US around the 70s. All that aside though, the reason I talk about being Latin@ as part of my feeling of alienation within the doula community here in the US is because it is majority White. Thanks for the background. It would appear that whoever gave me my previous information was entirely wrong. I was thinking that this might be a case of white people appropriating a tradition that developed elsewhere and then locking the culture of origin out but it sounds more like we’re just making it hard for anyone else to get in in the first place. I was wondering if radical doulas were independent of the gender essentialist natural childbirth movement? Reading the profiles, I saw a lot of standard NCB speak, but I am hoping this is not the focus of the radical doula, that a truly radical doula would support *all* mothers wishes in birth, not just the NCB approved versions (ie: no epidural, no maternal request CS, no “interventions”, MWery model only, and increasingly, no hospital). There is nothing radical about NCB; womens pain and safety have been denied and not even considered for ages, their experiences have been biologically defined and socially conscripted, and use of lifesaving technology has been denied them as well, so theres nothing new there.